Day 1 - Welcome to Costa Rica! : Costa Rica Outdoors met us at the airport and a private driver drove us to the Peace Lodge where we stayed in the impressive Monarch Villa, a beautiful lodge with a fantastic view of the central valley. Day 2 - Volcano and Coffee Plantation Tour: In the morning we were picked up by a guide and taken on a private tour of Poas Volcano with its stunning blue-green sulfur pools. From there, we went to the famous 112-year-old Doka coffee plantation where the beans are milled, dried and then roasted. After the tour we were taken back to the hotel. Day 3 - Canopy Tour: In the morning we were picked up for a canopy tour, that connected observation platforms mounted 75 feet or more in the branches of the tall trees. It was like a combination of the X Games and a beautiful rain forest! Day 4 - Pacific Coast: We were picked up in the morning by our private driver and taken to Zarcero, a small mountain village known for its hand-made crafts and rural traditional lifestyle. After the tour, which lasted most of the morning, we were driven to a nearby airstrip for our flight to Quepos on the central Pacific coast. After we landed, we were taken to the Hotel Costa Verde where we stayed in the spacious Casa Quinta. Day 5 - ATV Tour: After breakfast we were picked up for an ATV tour by a bilingual guide that wound through the stunning Fila Chonta Mountains, passing through palm, rice, yucca and teak plantations, roaring mountain streams, suspension bridges and primary rain forest. All the while we enjoyed awesome ocean views 3,000 feet above Quepos and Manuel Antonio. All the ATVs were only a year or two old and every person had their own ATV. Days 6 and 7 - Deep Sea Fishing: All five of us fished for two days on a 34-foot charter boat. We had an experienced skipper and mate and lunch, soft drinks and beer aboard were included. We caught marlin, sailfish, dorado, tuna and roosterfish. it was some of the best fishing we've ever done! Day 8 - Free Day: This day was free for us all. We decided to visit Manuel Antonio National Park, just down the road from our hotel. 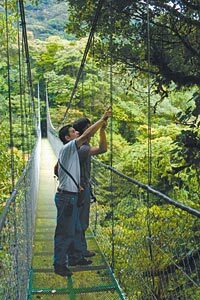 It is one of the smallest of Costa Rica's national parks but was stunningly beautiful, situated on a peninsula with many secluded coves for swimming and snorkeling. We toured the park on our own and saw spider, white face and howler monkeys. Day 9 - Another Free Day: The morning we spent relaxing on the beach. In the afternoon three of our party headed back to the airstrip in Quepos for their short flight back to San Jose. They were met and taken to the Hotel Casa Roland, a new hotel in a very nice area of San Jose, small and perfect for families. The other two stayed on in Costa Rica for an additional two weeks. Day 10 - Departure: Transported to the airport for our flight home.